At Kanchanaburi it merges with the Mae Klong river, which empties into the Gulf of Thailand at Samut Songkhram. The river is chiefly known from the Pierre Boulle novel and David Lean film The Bridge on the River Kwai, in which Australian, Dutch and British prisoners of war were forced by the Japanese to construct two parallel bridges spanning the river as part of the Burma Railway, also called the Death Railway for the many lives lost in its construction. One bridge was wooden and temporary. The other was made of concrete and steel and still exists. Ironically, the bridges actually spanned the Mae Klong, but as the railway subsequently follows the Kwae Noi Valley, the bridges became famous under the wrong name. In the 1960s, the upper part of the Mae Klong was renamed the Kwae Yai (big tributary). Vajiralongkorn Dam (formerly named Khao Laem Dam) is a hydroelectric dam on the river. In case there was any doubt concerning man's savagery to his fellow kind, then the Thai-Burma railway, all 415 kilometres of it, stands as a horrific testament to human brutality. Constructed under order of the Japanese by prisoners of war and enslaved locals during WWII, the Death Railway's most famous section, 'The Bridge Over the River Kwai', now acts as one of Thailand's major tourist attractions. The bridge is located in the small town of Kanchanaburi where the majority of guesthouses back onto the infamous Kwai River. The bridge is, well, a bridge. The history behind it however is far from ordinary. As the Japanese extended their invasion of Thailand into the West of Burma, their success was hampered by the difficulty in supplying troops with provisions and so a supply line, the railway, was built. The Japanese, using POWs and civilian conscripts, adopted a brutal and barbaric work regime that saw the completion of the railway in one year rather than the three it was estimated to take. These 'speedo' tactics cost the lives of a staggering three hundred thousand men. Apart from the bridge, Kanchanaburi's sites consist of two war museums and cemeteries. Museums at the River Kwai. The museums, lacking any substantial government funding, have basic but interesting displays. The English is at times misplaced and a little macabre but it does stop those who are floundering from stalling altogether. One caption for example, commenting on the detonation of the atomic bomb on Hiroshima, states that, "the city was destroyed in a jiffy". The main cemetery though, with its rows of gravestones cannot fail to touch upon the coldest of hearts. The ages of the dead are mind numbingly young; the average could barely be 25. 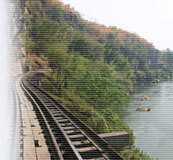 After exhausthing Kanchanaburi's city centre sights, you can opt to take a tour to 'Hellfire Pass'. The tour (you pay, they drive you places) included an hour-long elephant ride. Plodding your way through the jungle the novelty soon wears off though, elephants aren't half slow! Gimmicky as it seems, elephant riding is big business in Thailand and nearly every tourist tries it out at some stage of their trip. Most elephant rides deliver you to the stunning Pha That waterfall, where you cool off with a refreshing dip and change transport back to the four wheeled variety. Eventually you reach 'Hellfire Pass'. The pass is the most infamous in a series of cuttings along the Death Railway's course, and was so named because of the gaunt shadows cast by torch light as the workers dug through the night. Hellfire Pass took just 12 weeks to complete, the tools available were staggeringly basic; one reason why 70% of the cuttings workforce were dead by the time the job was done. Walking between the solid walls was strangely eerie. A drill head sticking out of the rock was a vivid reminder that this wasn't an ancient ruin but one horrifically young. Back in Kanchanaburi relaxing by the riverbanks, you can pass your time swimming in the river - the bridge upstream a vivid reminder of its past - but soaking up the stunning beauty of the region. For those who stay longer than the half hour it takes to walk the River Kwai Bridges tracks, a peace and tranquility so far removed from the horrors that have made this small town infamous await discovery in Thailand.